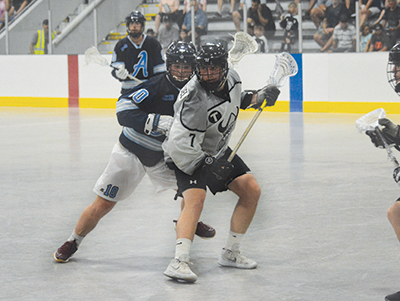 The Junior B Northmen are leading the St. Catharines Athletics 2-0 in their second round series after delivering a 6-5 win at Tony Rose arena on Tuesday (July 24) night. The Northmen came to the series after eliminating the Whitby Warriors in three games in the first round of playoffs. Game one of the second round got underway in St. Catharines on July 22. After a first period that saw the Northmen go ahead 5-3, the O-ville squad hung on through the second period to lead by two goals with one period left to go. The Northmen shut-out the Athletics 2-0 in the final period for a 9-5 win to start the series. Back in Orangville on Tuesday, the only scoring in the first period came from Northmen’ Kyle Waters and Zak Deaken. Waters got his second of the game in the second period. The Athletic got their first goal late in the second fram. O-ville’s Dylan Watson gave the Northmen a three goal lead with a marker with just over three and a-half minutes left on the clock. After giving up a St. Catharines goal early in the third period, Sam Firth goal number five for the Orangeville squad two minutes later. Sam Firth scored the final Orangeville goal around the midway mark in the period. powerplay to bring them within a goal of tying the game, but the Northmen held tough and managed to end the game with a 6-5 win. The win gives them a 2-0 lead in the series. The other semi-final series in the playoffs has the Brampton Excelsiors leading the Toronto Beaches 2-0. Game one of that series ended with a 10-2 Brampton win. Game two of the series saw the Excelsiors leave the floor with a 10-6 win. The Northmen will travel to St. Catharines on Wednesday, July 25, for game three of the series. The results of that game were not available at press time. Game four will return to Tony Rose arena on Friday, July 27.